A canvas printed thangka of Dorje Shugden's mandala in traditional “nathang” style. With Trakze, the wrathful form of Dorje Shugden, as the central figure and the 32-deity mandala of Dorje Shugden depicted in its entirety, this thangka is an excellent meditational aid for those engaging in Trakze's practice for protection and purification. 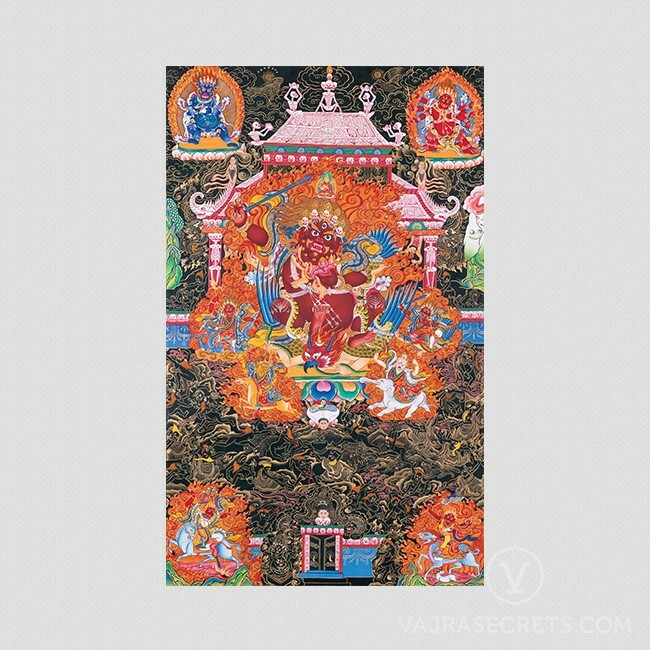 A canvas printed thangka of Dorje Shugden's mandala in traditional “nathang” or "black thangka" style featuring Trakze, the wrathful form of Dorje Shugden, as the central figure. The 32-deity mandala of Dorje Shugden is also depicted in its entirety, as are his main "assistants" Kache Marpo and Namkar Barzin. Trakze (centre): Also known as Karma Shugden, this is Dorje Shugden in his fiercest and most wrathful form. He is dark-red in colour, adorned with black silk garments, and rides a powerful garuda. He holds a fearsome sword in his right hand and bleeding heart in his left. His practice is excellent for bestowing powerful protection from harm, negativities, spirits and black magic, and overcoming the most difficult obstacles. Wangze: Also known as Pema Shugden, the "controlling" form of Dorje Shugden is blood-red in colour and rides a turquoise dragon. He holds a taming vajra hook in his right hand and a noose in his left. His practice is excellent for taming the most difficult minds, people and environments for virtuous reasons. Gyenze: Also known as Ratna Shugden, the "increasing" form of Dorje Shugden is yellow in colour and rides a golden palomino. He holds a long life vase containing a branch of the wish-granting tree in his right hand and bowl filled with jewels in his left. His practice is excellent for increasing life, material resources, merit, spiritual realisations, and abundance in all aspects. Shize: Also known as Vairochana Shugden, the "pacifying" form of Dorje Shugden is white in colour and rides a white elephant. He holds a five-coloured arrow in his right hand and a noose in his left. His practice is excellent for overcoming illnesses, disease, natural disasters and calamities, and purifying negative karmas and obstacles. Hayagriva (top right): The wrathful emanation of Cherezig, Hayagriva is very beneficial for those in need of healing from disease, especially terminal illnesses and skin diseases. He also offers powerful protection against Nagas and counters the after-effects of black magic and spells. Kache Marpo (bottom left): Kache Marpo is the main "assistant" of Dorje Shugden and is often depicted in Dorje Shugden's thangkas and mandalas. A fully enlightened dharma protector, he is an emanation of Hayagriva, the wrathful form of Chenrezig. Namka Bardzin (bottom right): A worldly dharma protector who was placed in Dorje Shugden’s entourage by the Mahasiddha H.E. Domo Geshe Rinpoche. His practice calms disturbances, violence and crime, and promotes peace, harmony, prosperity and growth. In the background is a three-tiered bone palace, the wrathful equivalent of the three-storeyed mansion of Dorje Shugden, along with symbolic imagery of bad weather, animals, rivers of blood and corpses. As such, this thangka is an excellent meditational aid for those engaging in Trakze's practice for protection and purification.